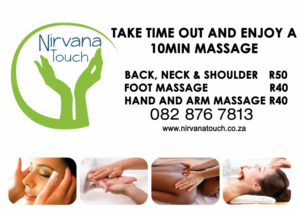 Nirvana Touch will be at the Bedfordview Night Market Grand Opening event on Friday 12th May 2017 from 6pm to 11pm. Offering massages at a discounted rate. The evening promises to be lots of fun with food from various parts of the world. Looking forward to seeing you there.